Back in the 80's, long before digital cameras, and many of today's UW photographers, were born, IBM came up with a brilliant idea. They distributed coffee mugs to employees of computer centers. On each of these mugs was printed the one word "THINK" in many different languages. I received one of these IBM mugs and set it on my monitor, continuing to drink from my Cray mug. The Cray supercomputer was the most expensive and fastest computer available at the time and I reasoned that if all the other people in the office were drinking from the IBM "THINK" mugs, I would work much faster if I drank my coffee from the more expensive Cray mug. 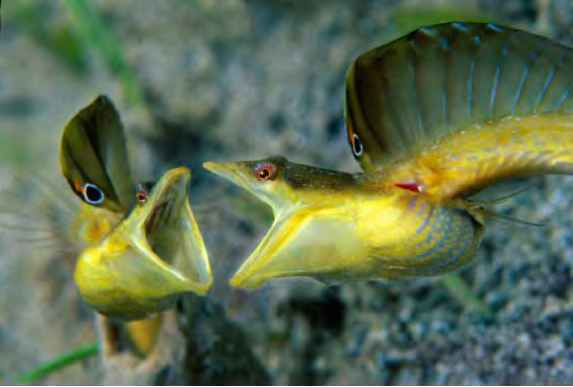 Underwater photo enthusiasts are always looking for ways to improve their images. The majority look at upgrading their equipment, adding a new lens or traveling to more exciting destinations. However there are basic things that we can do to improve our images, without spending any money at all. 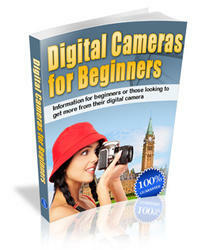 They apply universally to digital or film cameras, cold or warm water diving, point and shoot or expensive SLR cameras, beginner (and often) experienced photographers. And, they aren't technical. In reality, it doesn't matter if a photographer shoots a Cray or an IBM, this sentence applies to all: "Slow down and, like the ancient IBM promotion of the 80's, THINK about what you are trying to create". So many fish and so little time! You are new to underwater photography and want a photo of every amazing critter you see! You swim from fish SNAP! to nudibranch SNAP! to lobster SNAP! to eel SNAP! On every dive, see a subject; center it in the viewfinder; SNAP! move on to the next shot. Some carry two cameras each with a different lens to be certain they don't miss a single fish. At the end of the day or trip you'll have a large collection of uninteresting images that will put any coworker or friend to sleep. Double that if two cameras were used and possibly hundreds of times that with a digital camera. Quantity doesn't make up for quality. There are easy ways to create more interesting photos. LLS & Worms: As I watched, this slug crawled over and around the worms without any reaction from them. The scene had a good subject, a colorful background of red encrusting sponge and interesting surroundings for the LLS. I worked this scene for 30 min. taking several shots as the slug crawled and the scene changed. All the shots were good, but this was my favorite. (LLS). You don't have a photo of an LLS. Imagine too that you don't have a portable studio in your pocket so are forced to capture the image within the habitat the reef provides for this creature. Rather than centering this particular slug in the frame and "SNAP! ", first THINK. Is this scene is worth your valuable time underwater? Should you stop here or keep looking for a better scene? Is this an exceptional, unusual or at least undamaged subject? Is this slug clean or covered with ugly brown crud? If the subject/animal is common and is covered with silt, isn't a colorful example of the species, etc. your time will be better spent looking for another subject. You've found a good subject, in our example, a nice clean colorful slug. Now, analyze the background. Is there a good background for your subject? Is the background cluttered? Is it clean? If not, can you eliminate the background with lighting techniques? What about the color? Does the color of the background compliment the subject? I personally prefer colorful, clean backgrounds that complement the subject to blurred sand or black backgrounds. For samples of uninteresting Lettuce Leaf Slug photos I merely had to go back to my older images. There were plenty! A great background can make the shot. I cruise dive sites looking for good backgrounds and check for subjects when I find one. An Azure Vase Sponge is a superb background for any subject. Ask yourself if you can create an interesting composition given the equipment that you have with you. Is the slug going to be a tiny irrelevant dot in an entire wide angle scene? Or, do you have a macro setup appropriate for the size of the scene? Can you find an interesting angle? Are the immediate surroundings of the subject interesting? 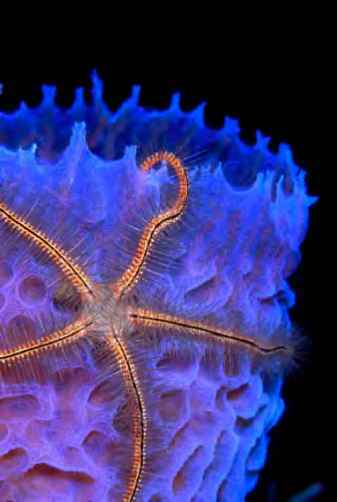 Brittle Star on Azure Vase Sponge. This is a simple image that has been published multiple times in dive magazines. It always catch's the art director's eye. The subject is clean, the background color spectacular. To shoot brittle stars at night, turn away being careful not to light them, set up for the shot, then move in for a quick photo before they move and the scene is gone. Nikon F4 + 105mm, Sea & Sea YS300 & YS120 TTL, Velvia, f16 @ 1/60, underexposed 1 stop. Should you focus close on the subject or include it as part of a larger scene? Or both? 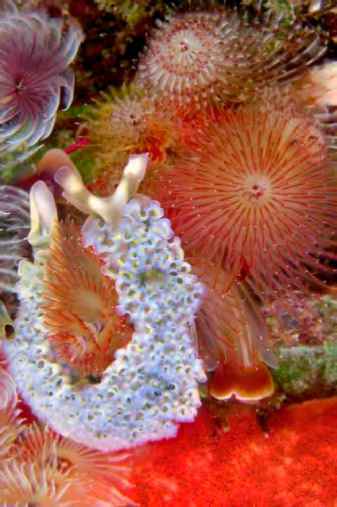 You are not required to photograph everything the divemaster finds. You are the judge of whether or not this scene will make an excellent photo. Don't like it? Don't shoot it. If this situation makes you feel guilty, my solution is to pretend you are taking one quick photo, and then keep searching. The divemaster won't notice you didn't actually take a photo. Your time underwater is limited. Be selective. THINK about the scene before you shoot and rather than spend your dive photographing dozens of so-so scenes, find a few good scenes that will make exceptional images to WOW your friends and be worthy of contest entry. Concentrate your time there. After you've found a scene worthy of a photo, take your time. Relax and examine the situation. Your approach and actions near the scene determine whether you get an excellent image, a tail shot or nothing. Don't go rushing up to a scene. Stay well back from the scene, far enough away that you don't spook the subject, decide what might be the best angle for your photo. Prepare yourself and your equipment for the best shot before you begin your approach. This applies both to wide angle and macro photography. Don't go with the obvious and easiest approach. You may be able to get below the subject, on a side with a better view or in a position where the subject will have a better background or be framed by surrounding reef structure. Before moving in, adjust camera settings and strobe positions for the image you want to get. I estimate how close I can get to the scene and sometimes focus on a nearby sponge, coral or sandy bottom at the estimated distance to help guide my settings. When everything is ready get in position and begin moving toward the scene. Hold the camera in position for the shot, i.e. vertical or horizontal. I hold the camera up and keep the viewfinder near my eye looking over the top of my housing as I glide slowly up to the scene. Obviously good buoyancy skills are a necessity, otherwise you'll be flailing around kicking up sand, bumping into the coral and scaring off your subject. For the final distance (which may be feet or cm. depending on the subject and lens) my eye is to the viewfinder. The first shot is often the best opportunity. I wouldn't take the chance of ruining it by trying to set up my camera too close to the scene. The subject may turn away from the camera or be frightened off immediately. With the Lettuce Leaf Slug (LLS) example the careful approach was not critical. 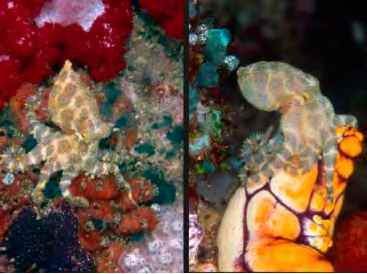 However with the Blue Ring Octopus and Pike Blenny examples I've included in this article the approach and continued slow movements were necessary to get the photos I wanted. Some skittish photo subjects will allow only one shot before making a quick exit. However, many will become accustomed to the presence of a photographer. This gives us the opportunity to wait for the creature to move into a better position or to do something interesting. While on a dive I saw that a tiny Blue Ring Octopus had been disturbed when I swam by and was about to scoot into a hole. Using my "Patient Approach" technique, I backed off, adjusted my camera and strobes, then slowly and stealthily I moved in toward the octopus. Whenever it looked nervous I stopped and waited. Within 2 minutes I was within arms' length. Over a 10 minute period I took 6 photos of the octopus as it walked across a chaotic background of tunicates and soft corals and then vanished into a hole! I waited. 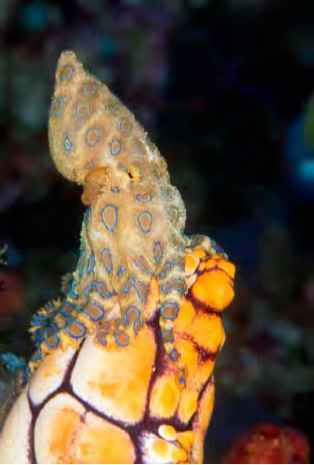 After 5 minutes, it came back out and crawled up to the top of a large sea squirt as if to get a closer look at me. In the end, I had 16 photos of the octopus taken over a 45 minute period of time, each a different pose and with many different backgrounds. You can improve your chances of getting great photos by limiting your movements and by backing off when the creature reacts to your presence. Some creatures will never let you close enough to get the shot you want. You can usually determine that within 2-3 minutes. I once gave a loaded Nikonos V and framers to a divemaster who had observed photographers for years. With zero technical knowledge and no training, he proceeded to carefully select subjects, consider the angles and position the camera before moving in for a shot. You could see him "THINK"ing. His first roll of film was near perfection. Underwater we have limits. Sometimes the limits are film frames, sometimes bottom time, sometimes the patience of our dive buddies. We can choose how to spend our time. Analyze and carefully select only scenes that will create the best images, use patience and concentrate on making outstanding images. Try different angles, different compositions and different lighting then choose the best of the multiple images. 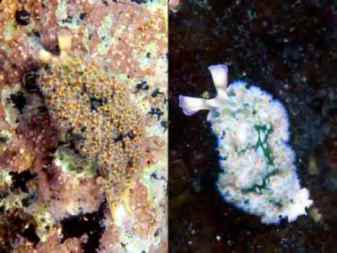 Often the difference in the images will be only background, the direction of an eyeball, or an out of focus piece of coral that will make the difference between a good and a spectacular photograph.